I started about 15 years ago with photographing in cities. My job as a journalist made me be more reflective about photography. Finally, my actual approach to street photography was very much influenced by the options of the internet. I consider myself as a street photographer since around 2006. I love to walk around and observe. And sometimes there are these magic moments, that only I can see and nobody else. That’s fascinating to me. Other people and me, we are in the same time on the same place, but however we are in different worlds. 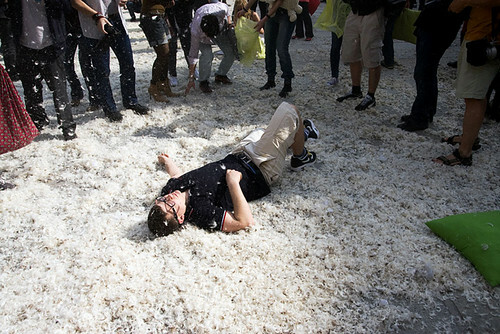 There was a pillowfight flashmob in the city of Vienna. I took this picture at the end of the fight. The square was completely full of feathers and the “fighters” were exhausted. This guy layed down in a bed of feathers, before they began to clean up. I like it, if viewers are confused about what‘s going on in my pictures. I seldom declare my captures, so viewers can create their own stories about it. There are so many good street photographers with completely different styles. I am – amongst others – really impressed about the work of Trent Parke, Alex Webb and Jens Olof Lasthein. Also the website of the in-public group has always been a great inspiration for me. This one I took on a carnival move. To me, carnival always has something weird, especially children with masks. Here I like the contrast between the laughing women and the strong face of the masked boy, who looks directly into my camera. Sometimes it helps to get a 2nd or 3rd opinion. But I’m very self-critical. So when I’m 100 % sure about my selction, I do not change my mind. Last question: I hope so! Here in Vienna we‘re a little bit jealous about how things developed in the UK. In Austria we definitly have a huge need to catch up. 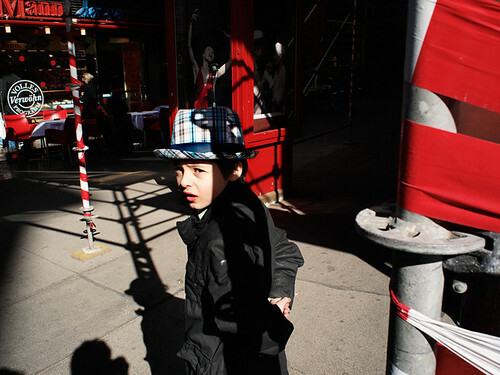 In particular contemporary ‘young’ street photography is completely underrepresentated. I notice, that here in Austria street photography has become popular among photographers, but has marginal significance for gallery owners and museums. I often visit the zoo, it’s always good for getting some captures. 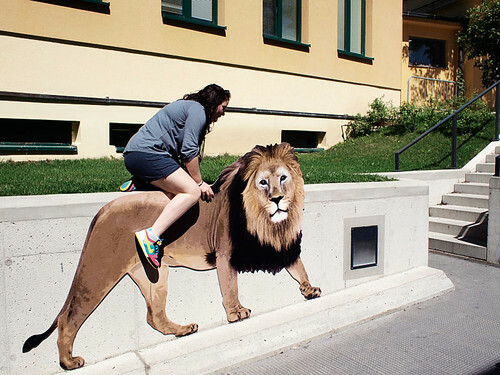 On my zoo visits I frequently notice, that people are more interested in imitations of animals than in the real ones. I have not found an explanation for this yet. <bAny tips or "words of wisdom" for other street photographers? On the street I always try to give the impression, that I’m just an amateur snapshooter. So people don’t take me seriously and I can do my work untroubled. An unremarkable outfit, good shoes and – as much as possible – a small, lightweight but fast camera with a 28 or 35 mm lens. I explored this nice place in the city of Vienna some months ago. I was fascinated about the light and the red colour everywhere. So I decided to wait for a moment for something to happen. Minutes later, a boy with an chequered hat came around and gave me a sceptic look. Thank you litte unknown boy for this picture! This entry was posted on September 12, 2011, 1:40 pm and is filed under Interviews. You can follow any responses to this entry through RSS 2.0. You can leave a response, or trackback from your own site. Rocking work! That feeling when you’ve walked the whole day and you’re not happy with what you’ve captured. Defeated, you start the long walk home then…BAM….you take one picture..and you know you have pure gold in your hand! proud, you look at it back home and your face is beaming with happiness. Other days just completely rock! 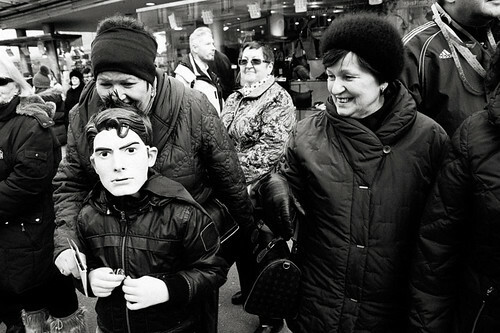 I love photogrpahy…and I love street photography even more.